Russian novelist; born in Saimoscha, near Slonim, government of Grodno, 1874; now a teacher in Yekaterinoslav. Bershadsky is one of the youngest Neo-Hebraic writers of fiction in Russia, and one of whom much may be expected. His "Zikronot Tugah" (Sad Memories), in "Ha-Shiloah," vi. 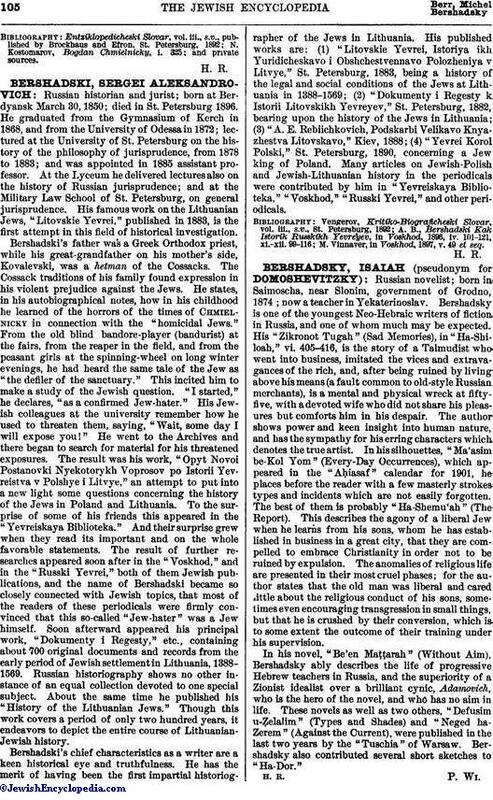 405-416, is the story of a Talmudist who went into business, imitated the vices and extravagances of the rich, and, after being ruined by living above his means (a fault common to old-style Russian merchants), is a mental and physical wreck at fifty-five, with a devoted wife who did not share his pleasures but comforts him in his despair. The author shows power and keen insight into human nature, and has the sympathy for his erring characters which denotes the true artist. In his silhouettes, "Ma'asim be-Kol Yom" (Every-Day Occurrences), which appeared in the "Aḥiasaf" calendar for 1901, he places before the reader with a few masterly strokes types and incidents which are not easily forgotten. The best of them is probably "Ha-Shemu'ah" (The Report). This describes the agony of a liberal Jew when he learns from his sons, whom he has established in business in a great city, that they are compelled to embrace Christianity in order not to be ruined by expulsion. The anomalies of religious life are presented in their most cruel phases; for the author states that the old man was liberal and cared little about the religious conduct of his sons, sometimes even encouraging transgression in small things, but that he is crushed by their conversion, which is to some extent the outcome of their training under his supervision. In his novel, "Be'en Maṭṭarah" (Without Aim), Bershadsky ably describes the life of progressive Hebrew teachers in Russia, and the superiority of a Zionist idealist over a brilliant cynic, Adamovich, who is the hero of the novel, and who has no aim in life. These novels as well as two others, "Defusim u-Ẓelalim" (Types and Shades) and "Neged ha-Zerem" (Against the Current), were published in the last two years by the "Tuschia" of Warsaw. Bershadsky also contributed several short sketches to "Ha-Dor."